LATEST NEWS BLOG FROM "AYRSHIREHISTORY.COM"
I have meant to reproduce this rough old photocopy, that came from an unknown source years ago. I often have foreign tourists in asking if I know anything about their relatives etc. Often they like to visit grave sites, and the plan view I have just created a pdf of is an invaluable aid. Really I should make the effort to have this placed in the notice board in the churchyard or something. Today I had relatives of HOOD of Sorn and Catrine visiting, and could I find the paper copy of the plan view of the old cemetery. I did find it about an hour after they left, and had a quick look around for the tourists, but they had already gone. Anyway, a link is given below, so as it will be easy to find any time. I took a spin to Troon South Beach again this past Sunday, 2nd Feb 2014. I think the beach may even have been worse looking than the previous week. A few images are shown, including four of the sea conditions. My apologies for one or two of the rubbish tip style images being taken at the wrong camera setting, but these are still included here. THE FISHBOX ON THE SHORE HAS BEEN REMOVED. 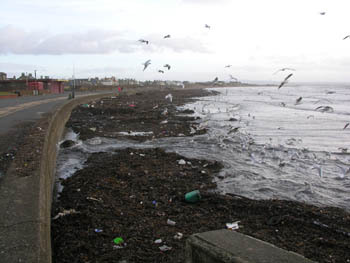 IS TROON SOUTH BEACH LIKE A BAD DAY IN BAGDAD??? If you are like me and strongly object to seeing our environment being abused by those that claim to protect it, please feel free to repost post this link. 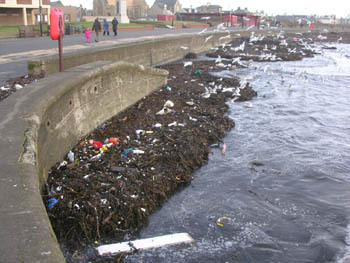 While walking along the shore in the last few weeks, the filth and the rubbish that is blowing around can not be over exaggerated. 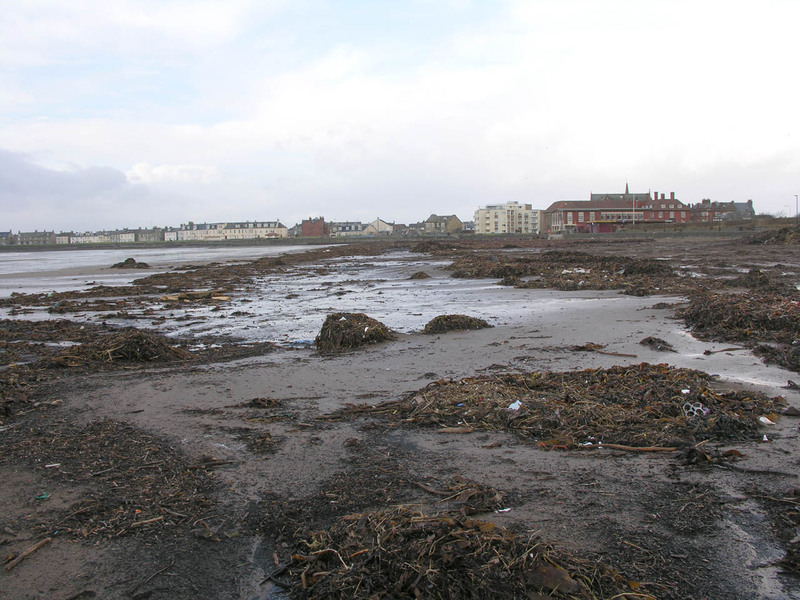 The following is a report on the state of the shores of Ayrshire, focusing on the litter and filth on Troon South Beach. Do not think that the following story is in anyway anti South Ayrshire Council simply for the sake of it. 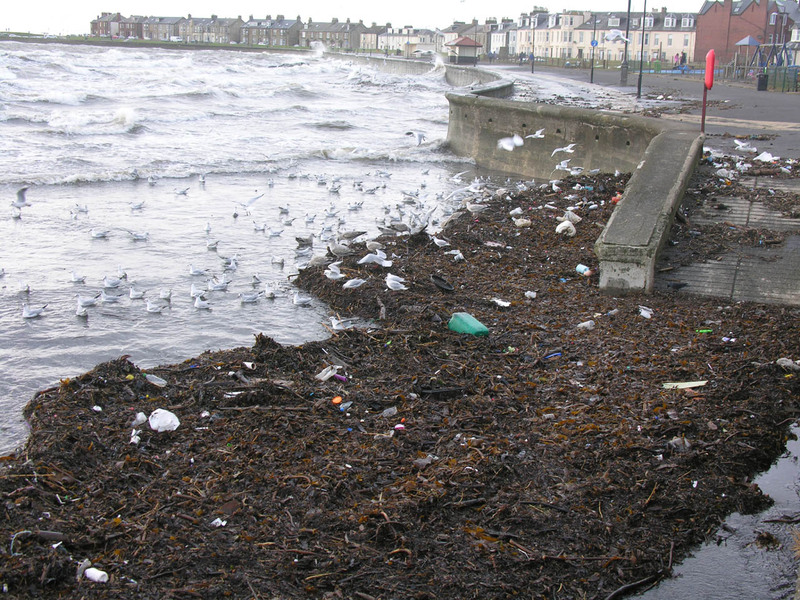 I know full well what the original source of the litter was in the first place, and it wasn't all from the couple of council bins that blew over into the sea during the high winds. 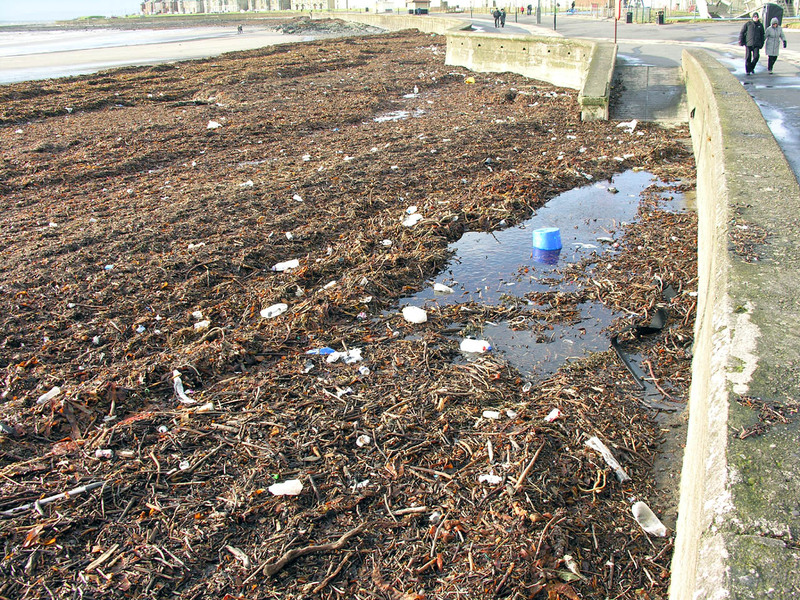 But the Council proudly claim responsibility for the beach, so therefore this article is aimed at those that claim responsibility for the cleanliness and safety of our shores. 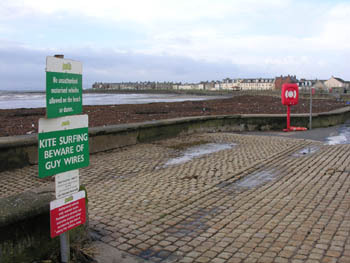 That responsibility is for SEAFRONT SAFETY AND TIDINESS. SOMEONES IDEA OF A JOKE? BUT REMEMBER THIS SIGN WAS ERECTED AT THE TAXPAYERS EXPENSE. JUST WHAT IS IT THE COUNCIL ARE CLAIMING TO BE DOING TO KEEP THE SEAFRONT SAFE AND TIDY? I THINK THE ANSWER IS TO BE SEEN BELOW. Filth and littering has always been a subject close to my heart. I have written a number of articles on the subject, and taken mountains of photographs of the rubbish that litters our countryside. Therefore I offer no apology for being rather abrupt, to the point, and out spoken while still trying my best to keep the language of this very public blog as "primary school" friendly as possible, a particular point of pride of this web site. When I was a youngster growing up in the 60's and 70's, I recall the so called public information films that used to be shown on television. "SCOTLAND IS LOVELY, DON'T SPOIL IT WITH LITTER" was one that sticks in my mind. Sadly some forty odd years later in 2014, these government short "adverts" have neither been heeded not even considered. Nothing seems to have been learned. There seems to be no pride in the natural beauty of our countryside around us. Yet today we as a race are supposed to be more environmentally friendly towards our planet than ever before. Oh yea?? Or so we are told. Or is this only when it suits? I visited Troon / Prestwick shores after the high tide in early January. The place was like an impersonation of a rubbish tip. So why should it have been worse some three weeks or so later??? 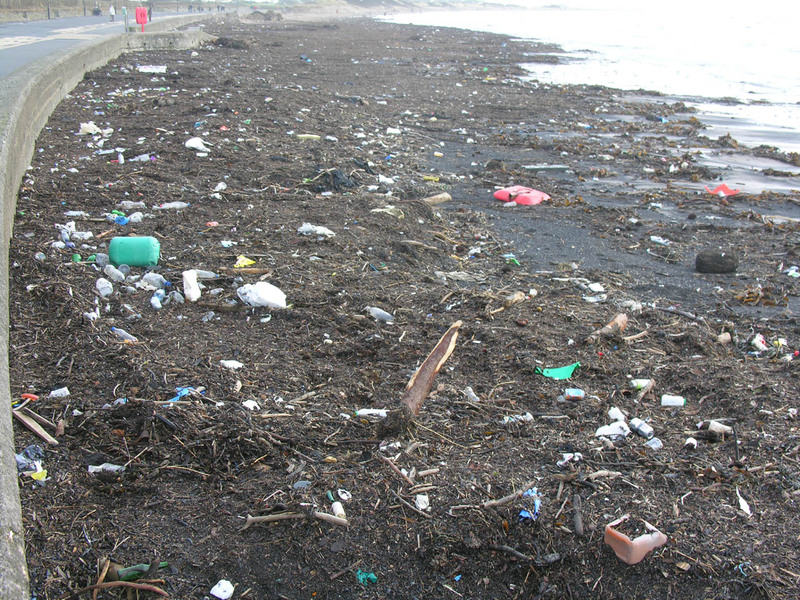 Is there any reason why there has been very little effort whatsoever to clean up this filth and litter that makes our beaches look like something from a bad day in Iraq? 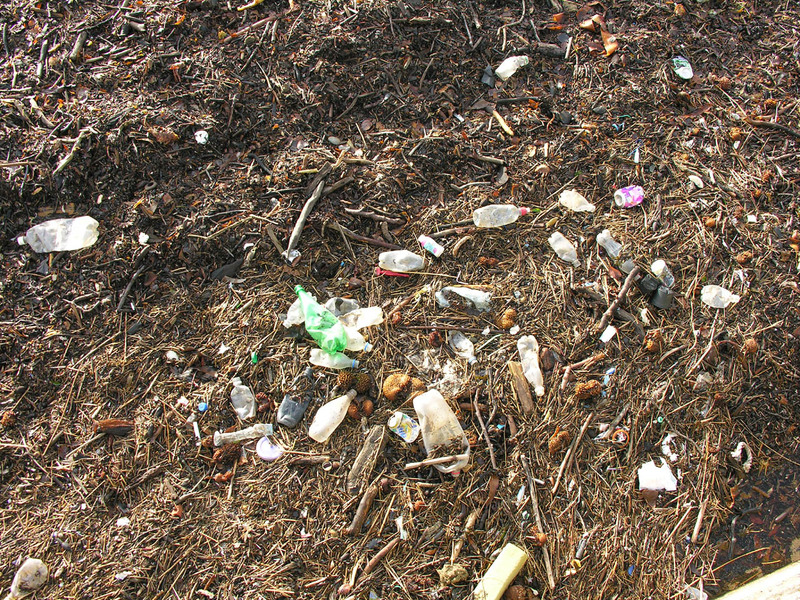 Why are there still the tons and tons of plastic waiting to be picked up? The place is absolutely disgusting, and a disgrace to Scotland. I have to admit that my initial visit to the beach after the high tides was driven by curiosity, on the lookout for something from the past. Perhaps an old bottle, or stone jar, or some other trove washed out of a wreck. 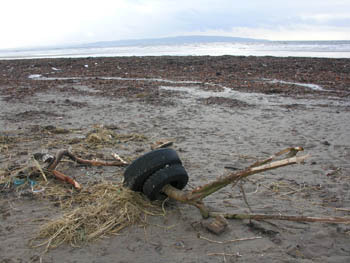 My romantic notions were however soon wrecked as I saw for myself the modern rubbish that litters our seas. 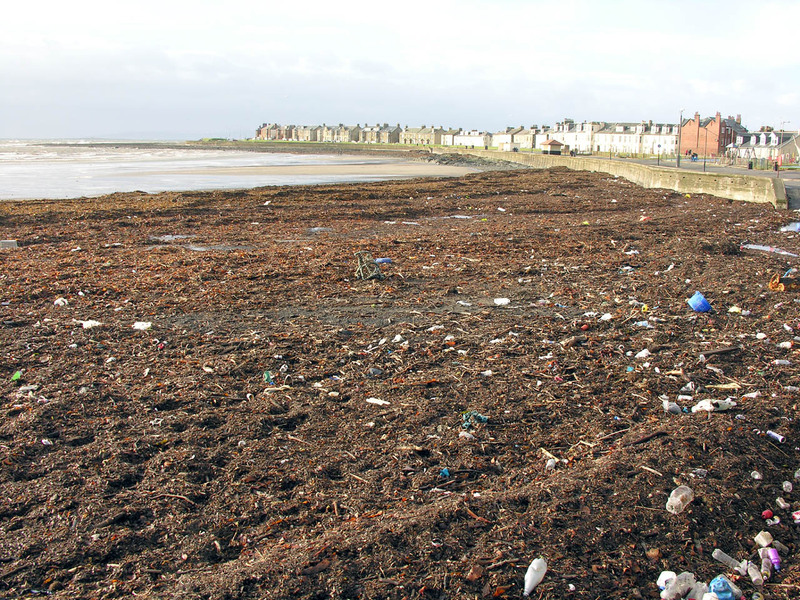 I would be ashamed to take any foreign visitors anywhere near Troon shore. 2014 is a so called homecoming year, HOMECOMING SCOTLAND 2014. My advice for would be travelers would be to choose your holiday destination carefully. 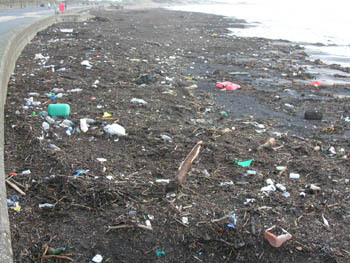 Why would you want to spent your hard earned holiday in a place where filth and rubbish is simply left to blow around? Travelers that have visited some of our European neighbours often remark about their clean cities, by comparison to the places closer to home that we are used to. Have a browse through the images below. Click on any image to give a higher res shot. If you don't think it looks too bad in the images given below, take time for a trip to Troon, and have a look for yourself first hand. The photographs do not really show properly what the eye can see. I can only describe the place as a breeding ground for vermin. NB: The images given below were taken on 26th January 2014, and are 100% genuine. They have not been so called "photoshopped" in any way!! All the rubbish you see in the images really is there!! 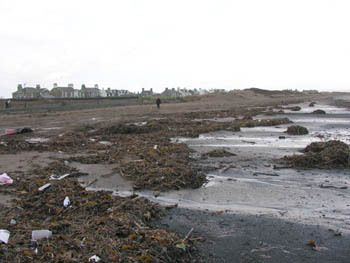 TROON SHORE - MIDDEN OF SCOTLAND. JUST HOW CAN ANY SANE PERSON RECON THIS IS ACCEPTABLE FOR A PUBLIC BEACH?? THIS IS TROON 2014, AND NOT THE BANKS OF THE TIGRIS. 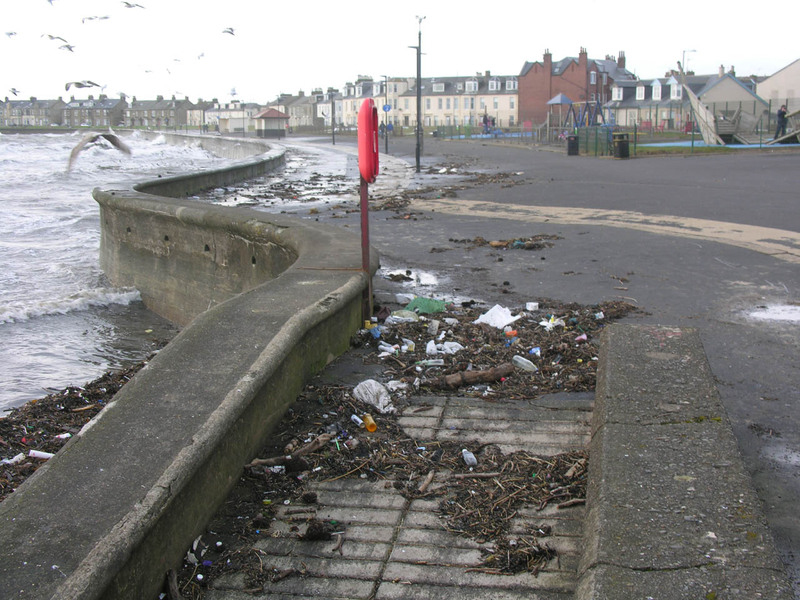 WOULD YOU WANT YOUR KIDS TO BE OFF PLAYING ON AN EYESORE OF A BEACH LIKE THIS ON A SUNDAY AFTERNOON? What is the source of this plastic? Well the problem is going to be partly linked directly to countryside littering. 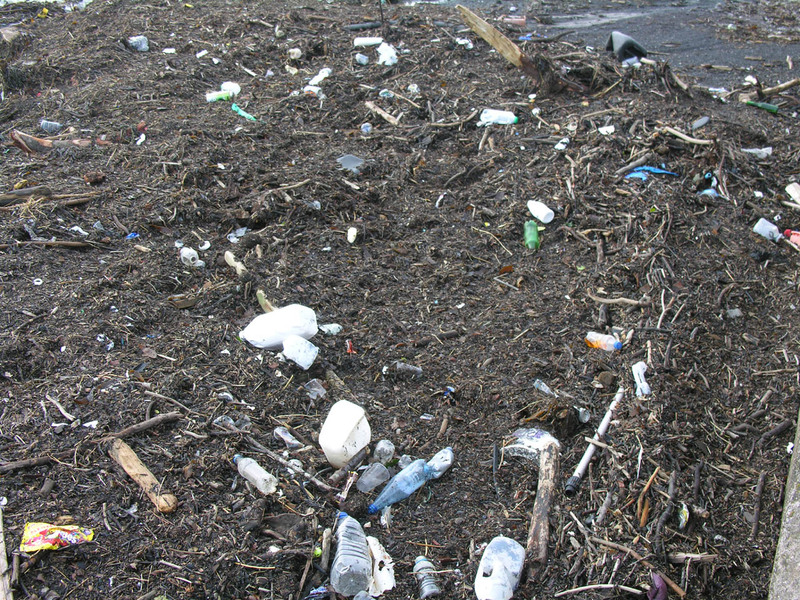 Some of the high rivers and flooding we have had this winter will have brought down more debris that normal, from higher on the banks of the river systems. Of course there should be no litter there at all. Ashamed we should well be of the mess of the various riverside paths. 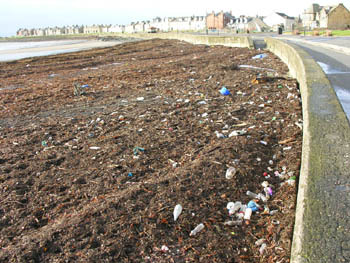 What is it with Ayrshire that seems to make it right to throw litter away in large quantities. Source is always a good place to halt a problem. But in this case, I just do not believe that source is ever going to realise it is wrong to pollute the countryside. What other sources are there? Ferries? Surely not. 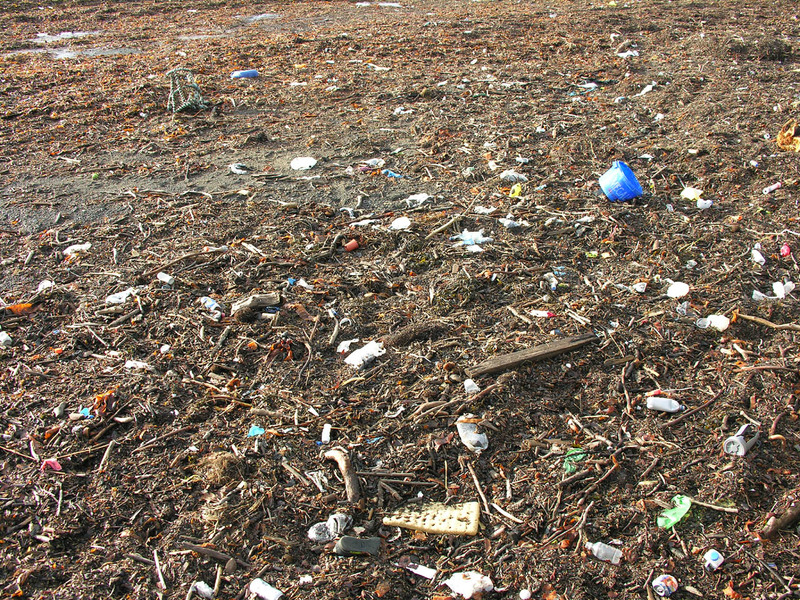 There is no need to be tossing litter overboard from a ferry. I can accept the ocassional fish box that is lost overboard from fishing vessels. 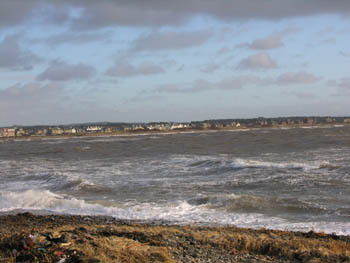 The one on Troon shore from Cloigerhead in Co Louth had come a long way. Of course the fishermen could have been off Scotland when it was lost. We will never know. I STILL CAN'T BELIEVE I WALKED OFF OF THIS SH*T TIP TO PUT AN IRN BRU BOTTLE IN A BIN!! I JUST COULDN'T BRING MYSELF TO DUMP IT, EVEN THOUGH THE PLACE RESEMBLED THE COUNCIL TIP!! PERSONALLY I COULDN'T BLAME ANYONE FOR SIMPLY STARTING TO USE THE BEACH AS A DUMPING GROUND FOR OLD MATTRESSES AND BUILDING WASTE. 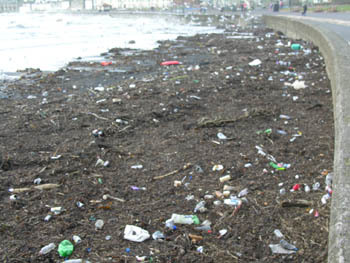 IT IS OBVIOUS NO ONE CARES, YET COME THE SUMMER, SIGNS WILL APPEAR ABOUT HOW WONDERFUL AND CLEAN THE BEACH IS!! BUT THEN WHO WRITES THE SIGNS UP? I had some correspondence on the subject with an SNP councilor, who wrote the following rather patronising email in response to an enquiry. I would have thought that especially the Nationalists would be trying their best to fall into favour of the entire Scottish population. After all, don't they want votes in the forthcoming devolution elections? Would you vote for a party that have a lackadaisical attitude towards filth and rubbish? 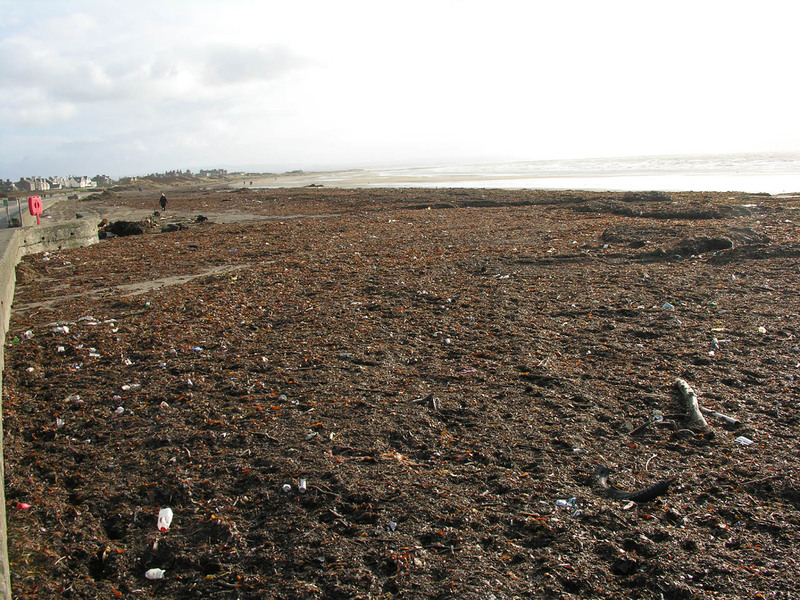 "Thank you for drawing this issue to my attention, I will contact cleansing to advise them and find out when they will be carrying out the cleaning of the beach . 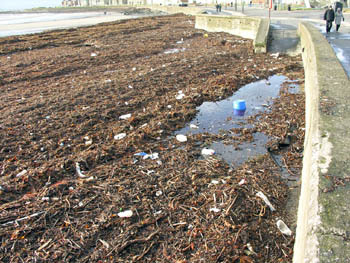 However let me take this opportunity to explain why the beach isn't cleaned during the winter months. 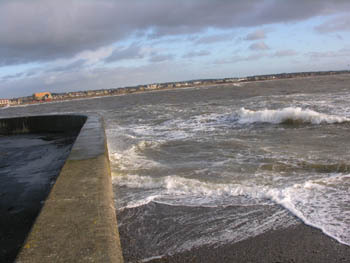 Cleansing do track the weather from September to March ,which is when we have most of the winter storms, this is to ascertain what damage they can expect to affect sea defenses, beach walls or sand dunes etc. 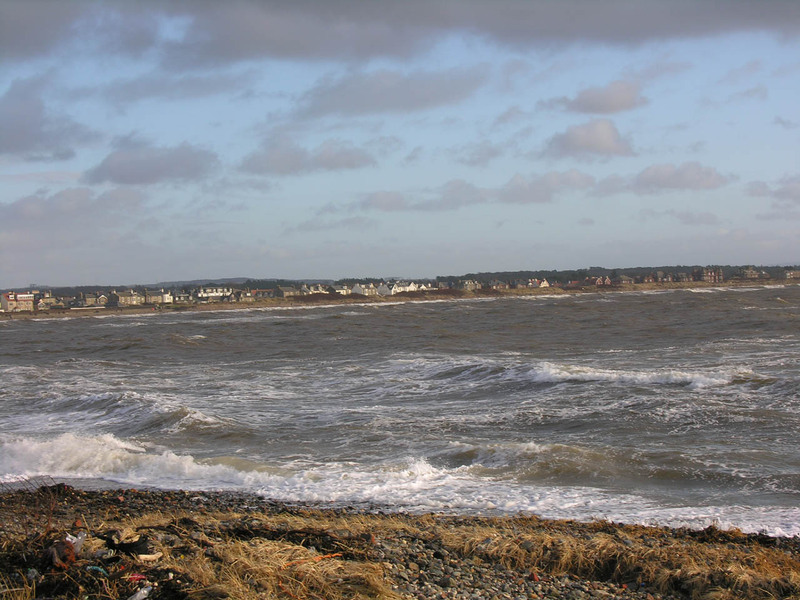 Cleaning of the beach is suspended during those months as they found that they would have to clean the beach after each storm and considering the number of stormy days we have had this year it would have been a very expensive and time consuming job. 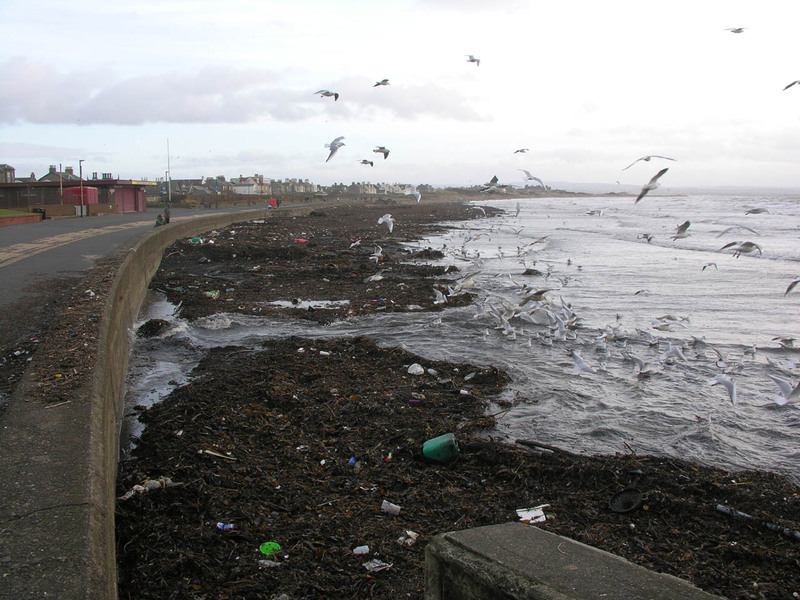 Given that we have 50 miles of beaches in South Ayrshire, most of them in seaside areas like Troon I have to agree that winter cleaning would take up most of cleansing's budget. I understand that the wrack on the beach does help to stabilise the dunes during stormy weather and assists with the beach eco system. 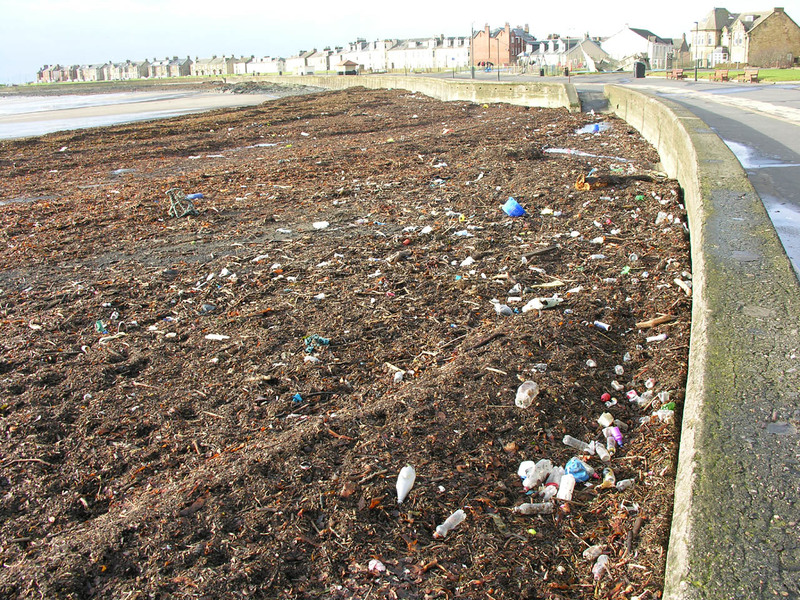 However I hope this has been helpful to explain the council's side of this issue and I will get the officer to give me an update on the beach cleaning programme." What are the modern day silly buzz words that describe a reply like this? White wash? Spin? Smokescreen? Or simply put in good old Ayrshire terms, a pile of sh*te!! Was this response to my email written by someone that hadn't even seen the devastation first hand? Remember it is action that is required, not lame excuses. 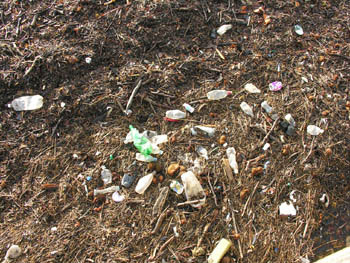 Since when were plastic bottles and crap described as beach wrack!! How in the world is plastic litter at an extreme that the place could easily be confused with a rubbish tip, helping with the beach eco system. Well I suppose it will encourage the rat population. Does this mean I should take my extra rubbish to Troon and simply dump it on the beach and pretend that is is great for the eco system!!! 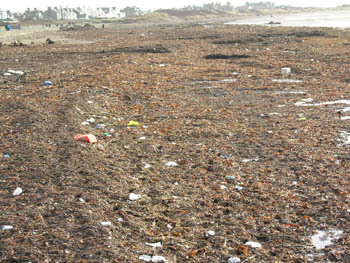 Remember my issue here is obviously with the tons of plastic that is of course man made waste, and not with the sea weed. Although natural rotting vegetation is not particularly desirable, it is just that, natural vegetation. It would make for a nicer beach to walk and play on yes, if the seaweed was lifted. 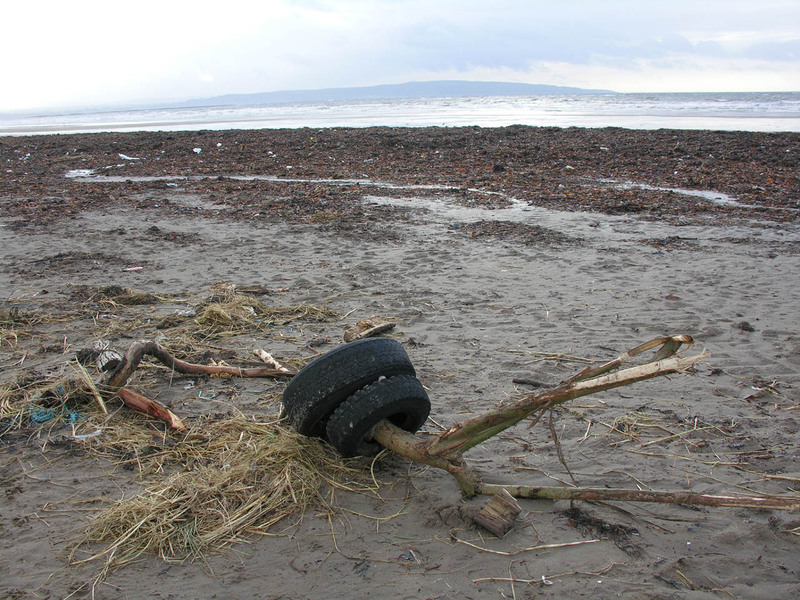 But first and foremost I think the priority should be given to having the plastic lifted and disposed of / recycled etc so that it does not get washed back into the sea at the next high tide. (Yes, of course I am all for recycling, especially plastics) I am surely not alone in believing that this litter should not be allowed to be washed back into the sea. We surely owe future generations at least this small mark of respect. 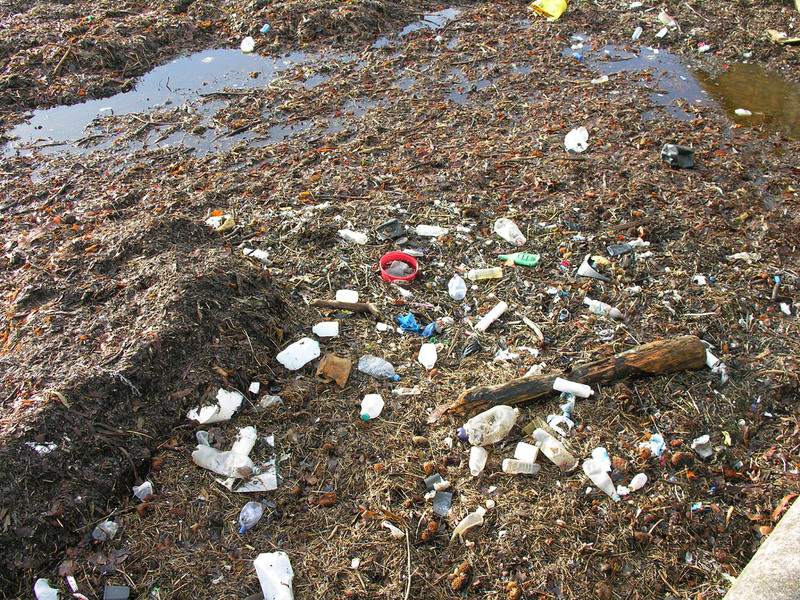 If most of this plastic was washed in from the sea, don't we as a race feel some kind of an obligation to the environment to make a concentrated effort to remove the plastic that litters our seas as it washes up, and try our very best to discourage this level of littering ever again. Difficult may that be. 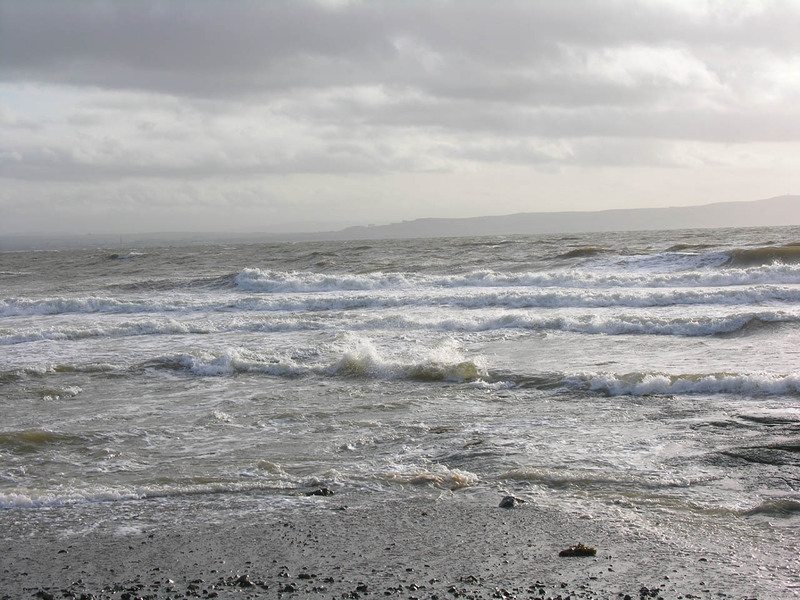 It can hardly be described as wise to suggest "Why bother at this time of year" "The same again will wash ashore with the next high tide, so why should we". Why wash your face in the morning? Why empty your bins? Why clean your windows? Look beyond Coronation Street for a second. If this is the level of plastic rubbish that we as a race have filled up The Firth of Clyde with, should we not hang our heads in shame? We should surely not shug our shoulders and say "What's the point". 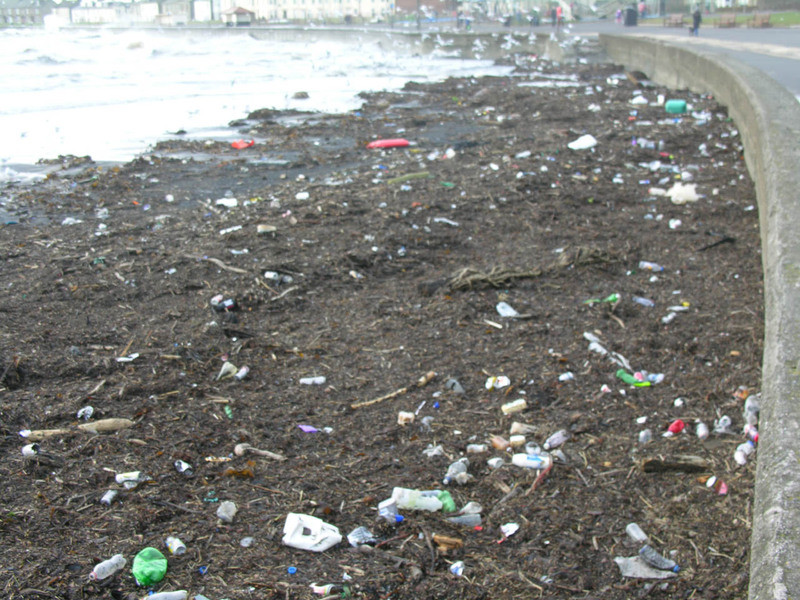 If a concentrated effort was being made to lift this filth with every high tide, we must reach a time when improvements will be noticed! If there were to be a much larger effort encouraged at national level, or even an international effort to physically "pick up plastic" the job may not soon be done, but a brave effort to start could at least be made. After all, how many extra wages would it really require for example for the shores of South Ayrshire?? What would it really cost in percentage terms of government funds? 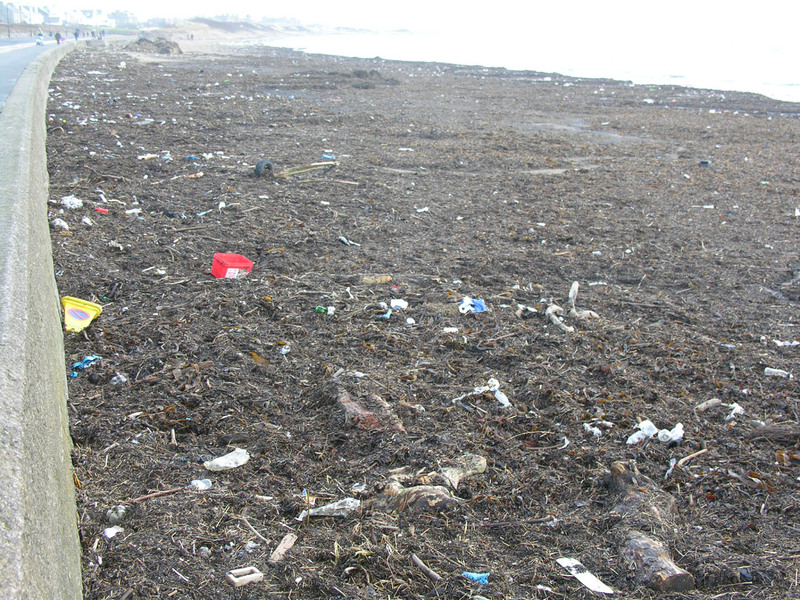 What is desperately needed are teams that are not scared to get their hands dirty and physically pick up the plastic. Not run over it and shift it from one spot to another with a silly tractor!! 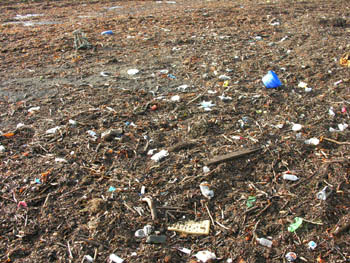 The plastic will still be there beneath the sand if it's not lifted, waiting for another high tide. What's wrong with the community service teams that are often seen working on the county pathways etc, if the cooncil workers don't want to get their hands dirty, or if the toon cooncil are scared to part with a fair days pay for a fair day's work? I'd be happy to join a cleansing team myself if they were prepared to pay me a proper wage. I am certainly not scared to get my hands dirty, and I wouldn't need a crash helmet and space suit to do the work either. Why should it take a non Troon resident to highlight this problem? I am surely not the only person that thinks this is a disgrace?? There must be others writing to the press or writing to their MPs for what it's worth, complaining about this outrage. A one man crusade is simply not enough. Feel free to repost this link if you feel strongly enough about the subject which is really pollution of our seas. TROON - AWARD WINNING BEACH.... YEA RIGHT. IT IS HOWEVER HIGH IN THE RUNNING FOR THE AYRSHIREHISTORY.COM FILTH RIDDEN BEACH AWARDS FOR 2014!! SO WHAT'S THIS ALL ABOUT THEN?? WHO ARE THEY GOING TO FINE FOR LEAVING TROON IN THAT STATE?? EACH OTHER? WOULD IT BE TAX DEDUCTABLE? SO THEY WOULD HAVE FINED ME 20 GRAND FOR DROPPING MY IRN BRU BOTTLE THE OTHER DAY?? 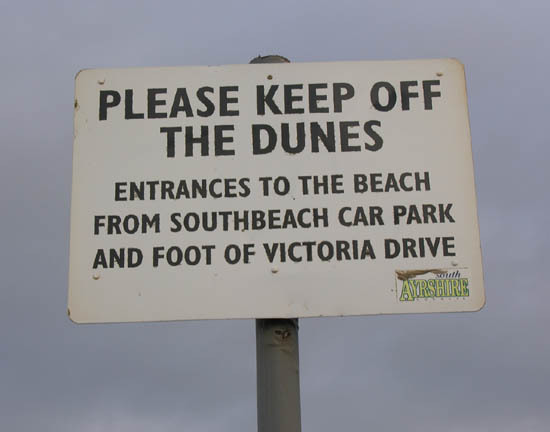 WHAT DO THE BEACH FRONT RESIDENTS AND IN FACT THE GENERAL POPULATION PAY THROUGH THE NOSE IN COUNCIL TAX FOR?? THIS WHOLE BUSINESS OBVIOUSLY NEEDS A FULL INVESTIGATION. OK, perhaps some of this article is written somewhat tongue in cheek, but the photographs don't lie. To summarise, what is really desired at the end of the day then? 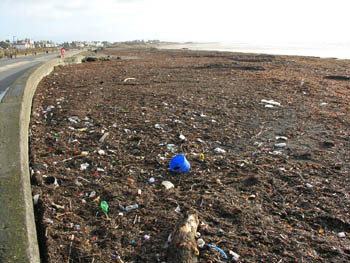 A continuous clean up campaign would make more sense and be beneficial to the environment. 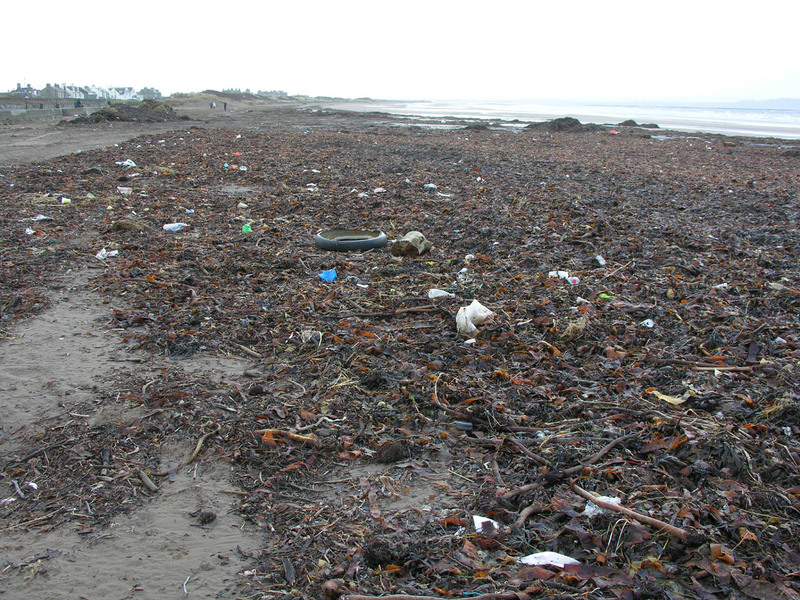 What is the point of a seasonal clean up, when the plastic that pollutes the Firth of Clyde is present all the year round, and indeed is washed up during heavy seas giving a perfect opportunity for removal from the equation. Or to put it another way. 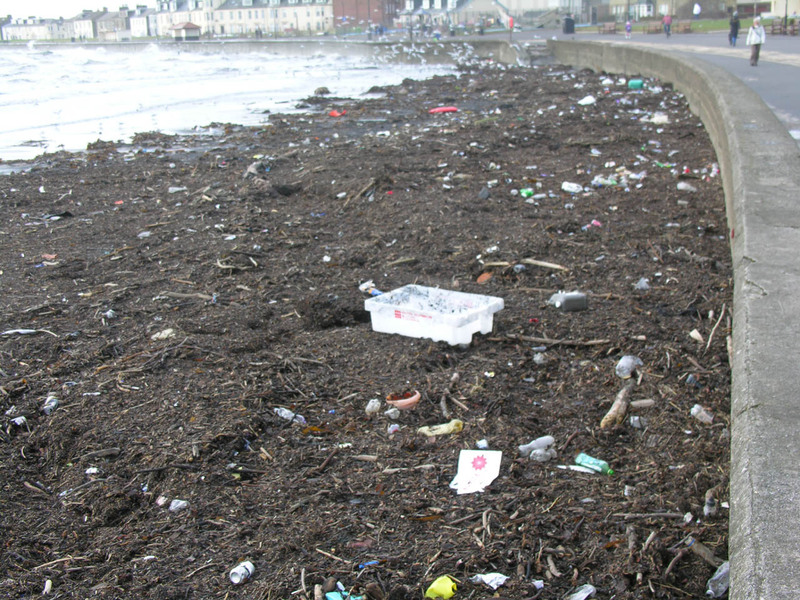 Should we be allowing the rubbish to wash on and off the shores of Ayrshire at will, and care not, or should we begin to look ahead beyond the rose tinted glasses, and at least try to clean up our seas and coastlines. 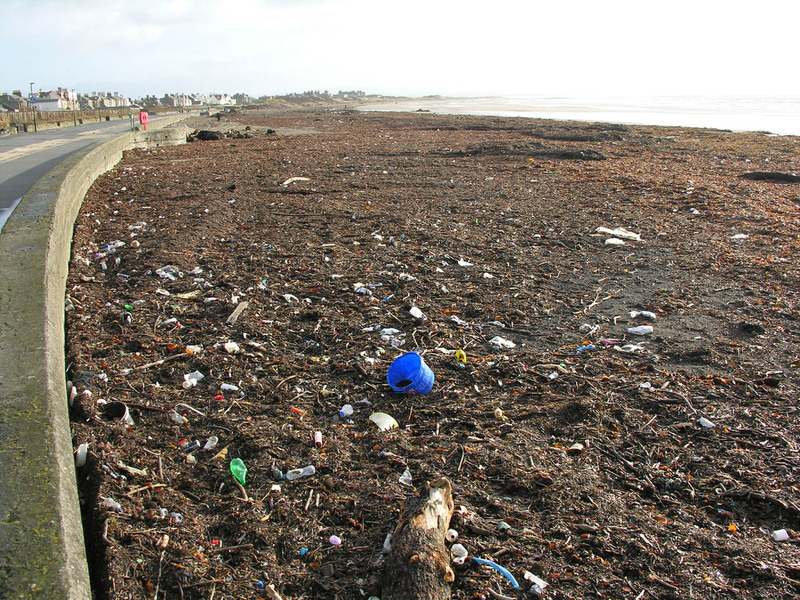 Could a "pick up plastic" campaign be adopted easily across the country? After all, public awareness of this problem has already been created by documentaries such as the Planet Earth series on television. And finally. What completely harmless bio degradable alternative is there to plastic bottles? Glass isn't a great option either. Who wants to step on broken glass on the shore? What else is there? 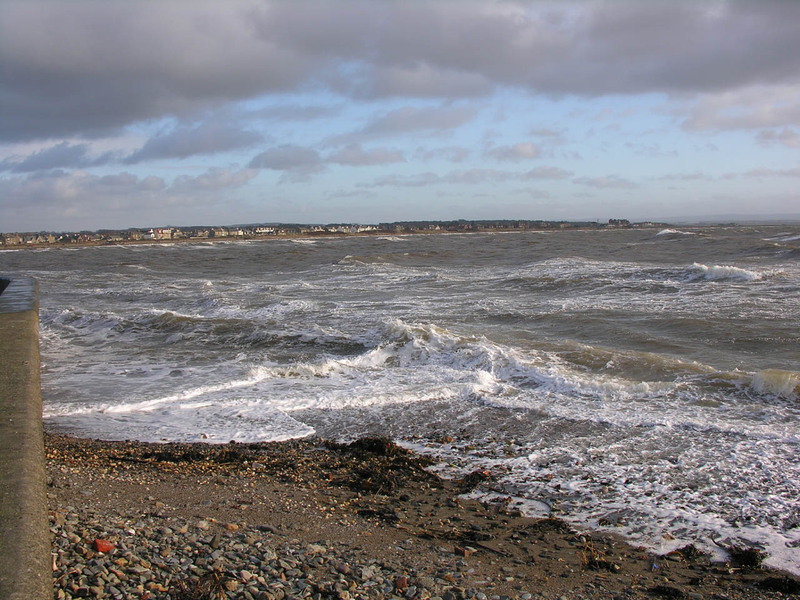 The Council is responsible for cleaning amenity and recreational beaches under their ownership above the mean high water mark. 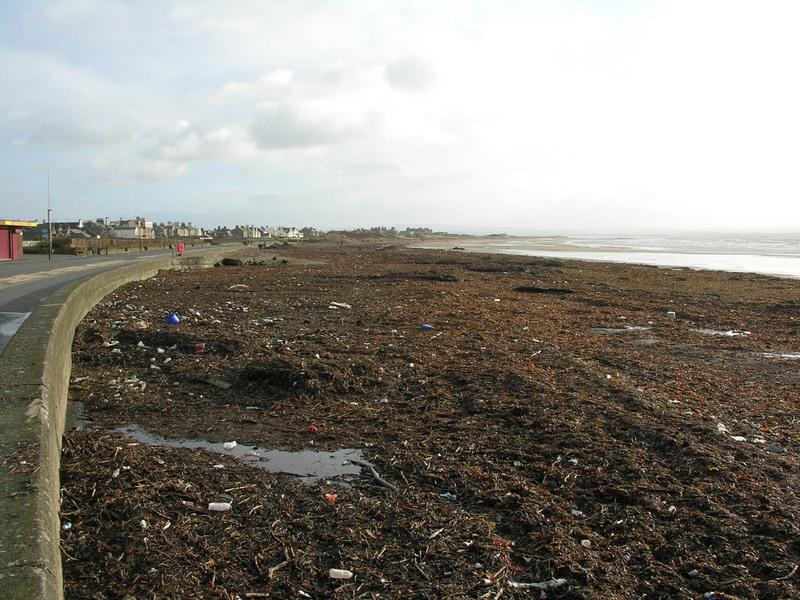 Managed beaches require to be cleaned of litter in accordance with the Environmental Protection Act 1990 Code of Practice on Litter and Refuse. 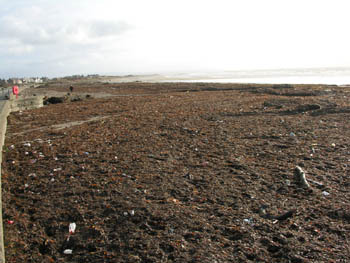 This code specifies that managed beaches should be cleaned to Grade B standard (some small pieces of litter evident) throughout the year and there are varying response times for returning the beach to Grade B standard depending on whether the beach is an amenity or recreational beach. 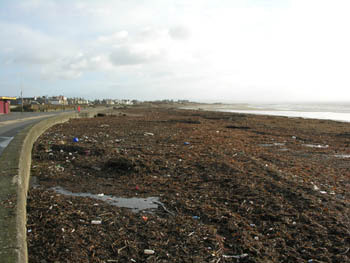 The definition of litter does not apply to seaweed, and the presence of seaweed is beneficial to beach ecology. Mechanical cleaning of beaches should not be carried out near sand dunes or other sensitive beach aeas. 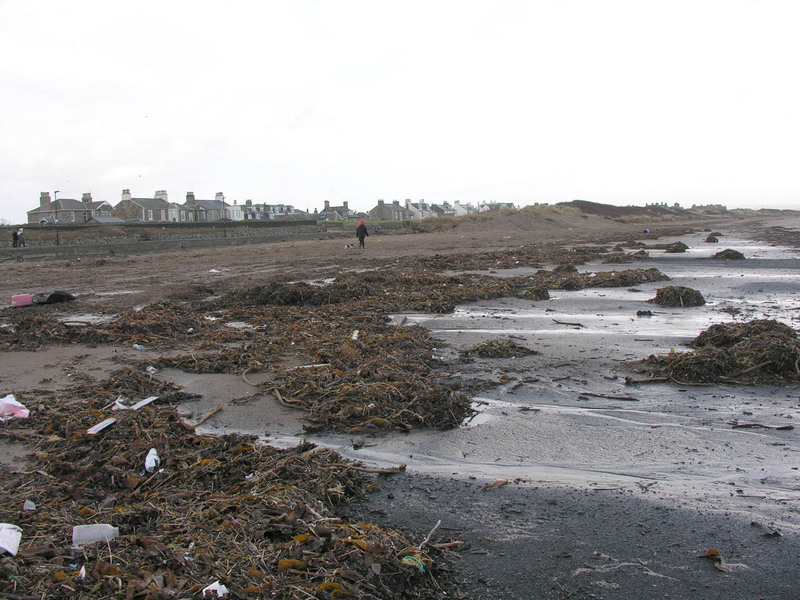 There are a number of private beaches in South Ayrshire for which the Council is not responsible for cleaning. 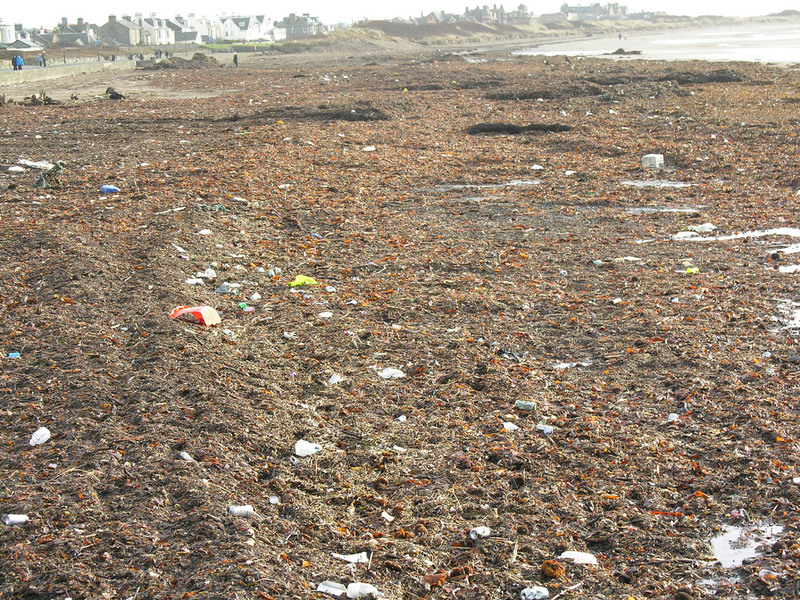 When are the beaches cleaned? 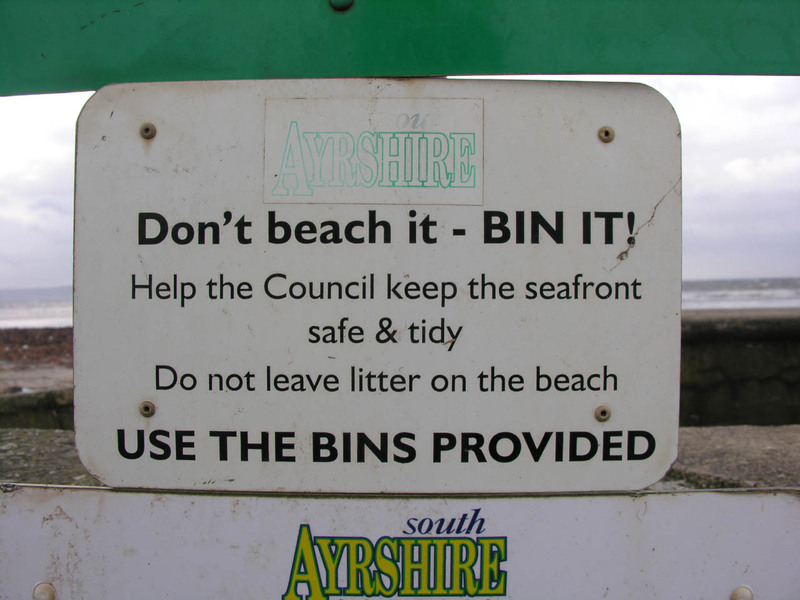 South Ayrshire Council is responsible for cleaning its own Amenity beaches during the months May to September. Some additional cleaning may be carried out during the winter months as required. 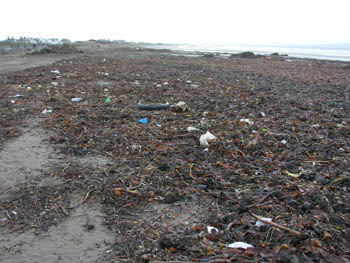 A number of beaches are privately owned although there is no responsibility on the owners to clean their beaches unless they are managed as amenity beaches. For further information call 0300 123 0900. 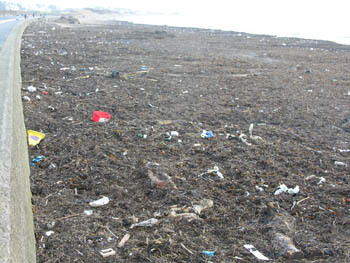 I am organising a voluntary beach cleanup. Can I get help with protective gloves, litter pickers and removal of the rubbish collected? Yes. Contact the Customer Contact Centre. 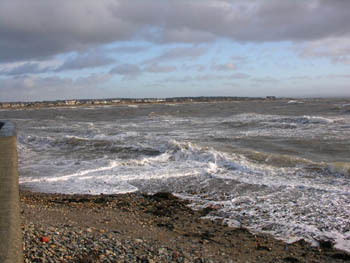 Troon is still a popular place to visit for those who wish a day at the seaside and is one of the few west coast beaches to have been granted the Clean Beach Award. 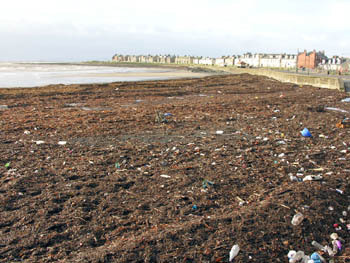 "TROON IS JUST AS BEAUTIFUL IN WINTER AS IT IS IN SUMMER!!!!!" Our countrysides are filthy. This is not helped by consecutive local authorities employing binmen who won't lift rubbish, and even imposing charges on people who volunteer to take rubbish to the tip at their own expense because binmen won't lift rubbish. The refuse collection system is now a complete joke. Recent developments have even seen van and trailer owners being discriminated against and having to "sign in" at the tip to dump rubbish!! Who do these people think they are, Yahoo or something?? It's a tip for god's sake, not an RAF base. The tips are supposed to be there to provide a public service!! So with this in mind, there is little wonder the countryside is heaving with litter. Until they outlaw this obsession for shifting the goalposts at every opportunity making it more and more difficult to get rid of rubbish, the various local councils will continue to have this littering problem on their conscience. 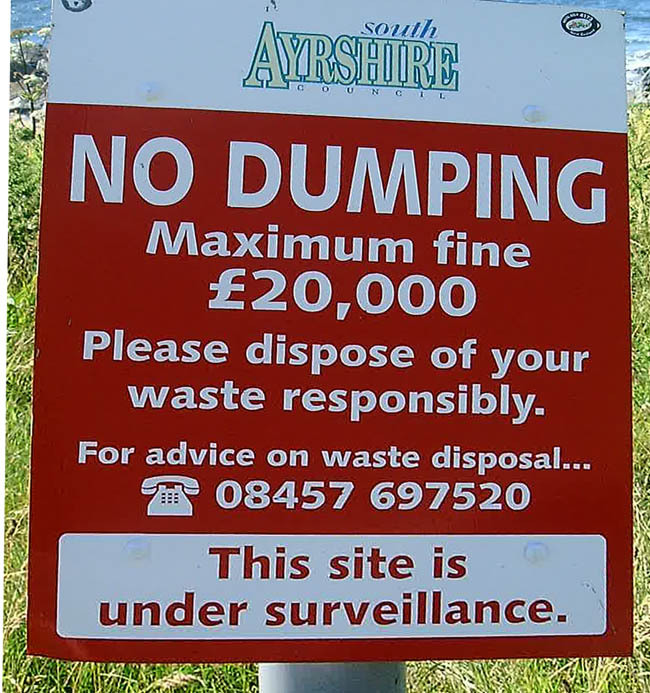 Incidentally, one of the most ridiculous things that I see often on my walks around Ayrshire, is the amount of dog sh*t bags littered around the countryside. If you are going to the trouble of picking up the dog crap in the first place, what is the point of throwing the bag with contents into the bushes, on the ground etc? Would it not be better to leave the contents where they were, and it saves another piece of plastic littering the countryside. It is only dog sh*t after all and not nuclear waste. Farmers do spread similar material on the fields, to help grow the crops that we eat!! THE ABOVE APPEARED NEAR MAUCHLINE AS THIS ARTICLE WAS BEING PREPARED, AS THOUGH THE DUMPER'S KNEW IT WOULD BE PHOTOGRAPHED! A SPLENDID EXAMPLE OF WHAT THE COUNTRYSIDE OF AYRSHIRE IS REALLY LIKE. NOT WHAT YOU SEE IN THE GLOSSY TOURIST BROCHURES!!. WOULD YOU BE PROUD TO TAKE FOREIGN VISITORS A TOUR OF BURNS COUNTRY TO LOOK AT THIS DISGRACE? 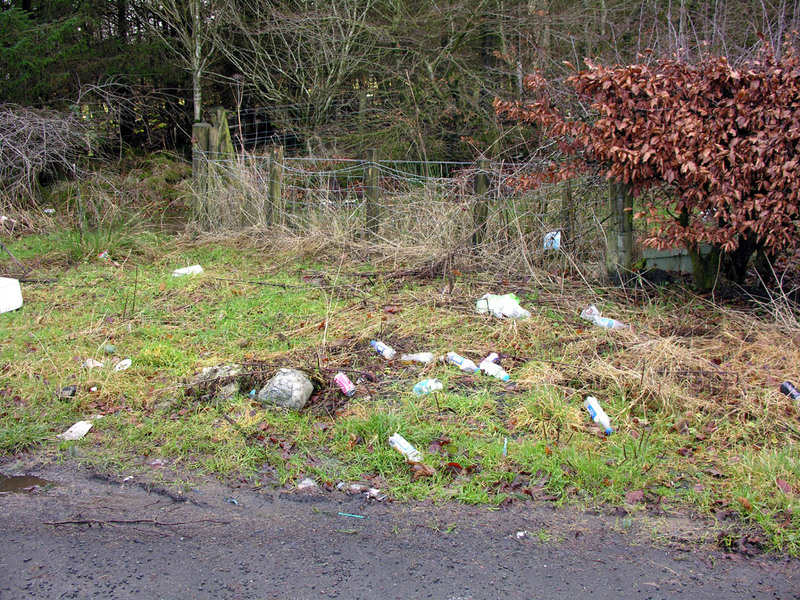 Above, is another mess near Mauchline, which appeared at the end of January. But think about this. 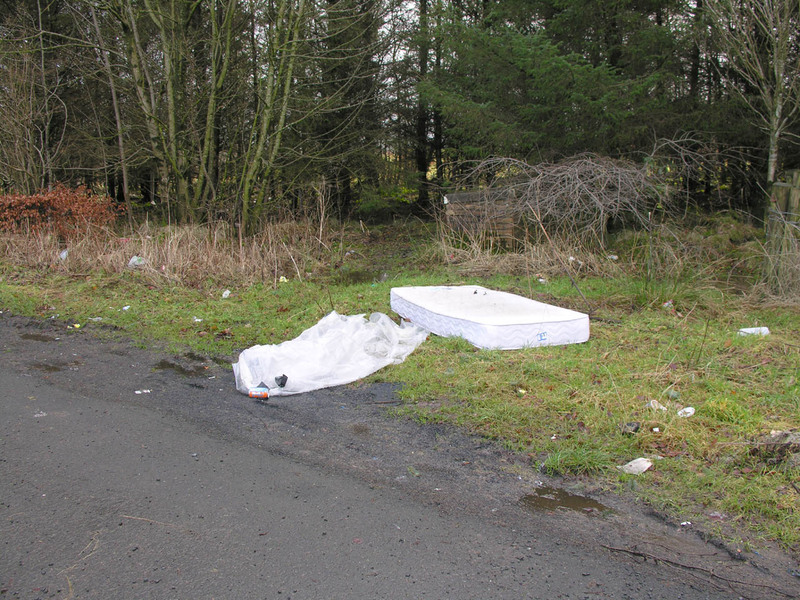 Who can blame "Auld Jessie" for dumping that manky old mattress at a layby, if the cooncil are going to take twenty quid off her (or whatever the charge might be!!) for it's disposal. Or how about "Wullie" that goes in with a van load of rubbish to the coup, thinking he is doing the right thing, but he finds they won't take it, and send him packing? (Names obviously fictitious for the story). What is the most recent policy regards uplifts? The councils should make it known that all uplifts will not be chargeable, instead of imposing limits, and whatever else on the population's already overstretched pockets. They are obviously creating more problems. But the above is only half the story. Before these plain stupid rules were conjured up from thin air by goodness knows who, the binmen were not shy of lifting rubbish, and would lift anything that was put out to them, at least our local chaps did. But even back then, one could still see a mattress, or an old fridge dumped down the woods! This is a very different subject. I would describe dumping in the countryside and spoiling the environment for absolutely no reason what so ever as moronic dumping. And I highlight again, this was a complete waste of effort on behalf of the dumper, when anything and everything was lifted from your doorstep. But what of today's ridiculous regimes?? Today it is a very different and disturbing story that needs to be addressed at the highest level. As I said above, the very least we owe future generations is surely to pass on a clean environment. Not pass on a hazardous waste dump.